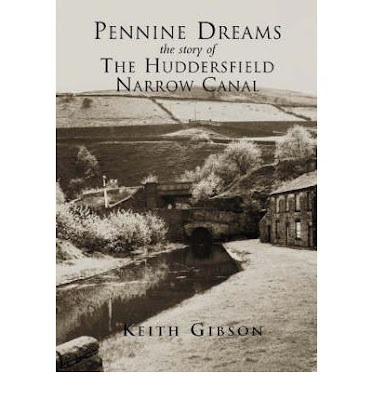 I mentioned previously that I had been reading Pennine Dreams as I made my way along the Huddersfield Narrow Canal, a copy I picked up at the Marsden gift shop but nearly balked at the hefty £16.99 price tag. 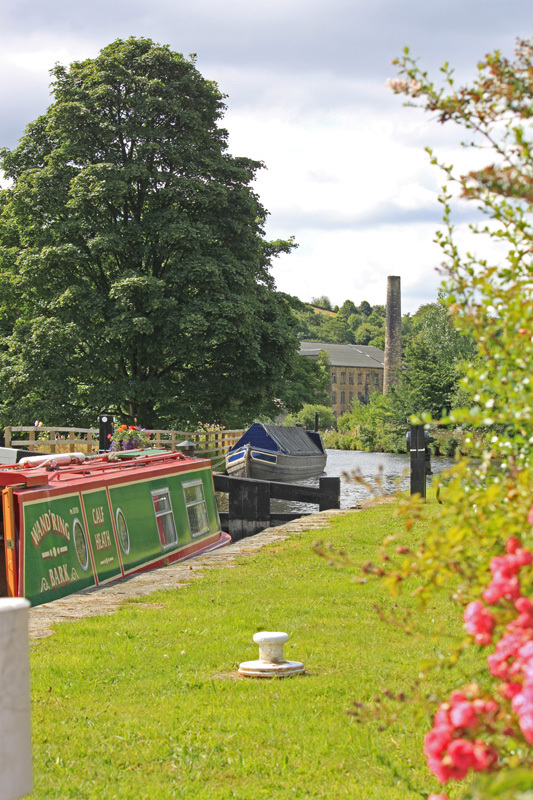 It was, of course, a fitting companion to our trip along the canal as we journeyed its 20 odd miles from Huddersfield to Ashton under Lyme. The book is a meaty read by any standard, its 150 pages crammed with details and photos which represents a definitive anatomy of a canal restoration, written from the perspective of the Huddersfield Canal Society who spearheaded the project. 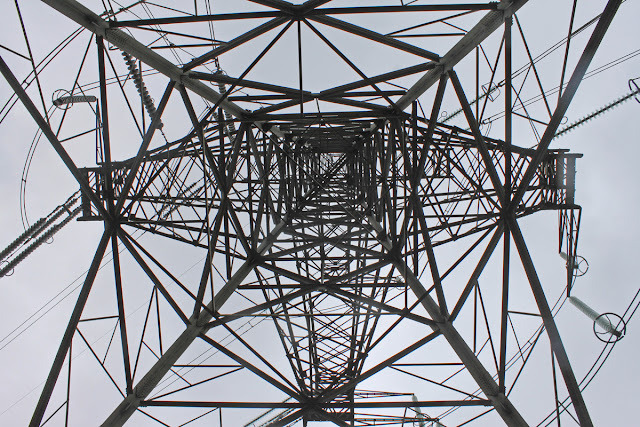 They moved it from a fanatic's pipe dream to a living reality which gripped the imaginations of the various local communities along its route. 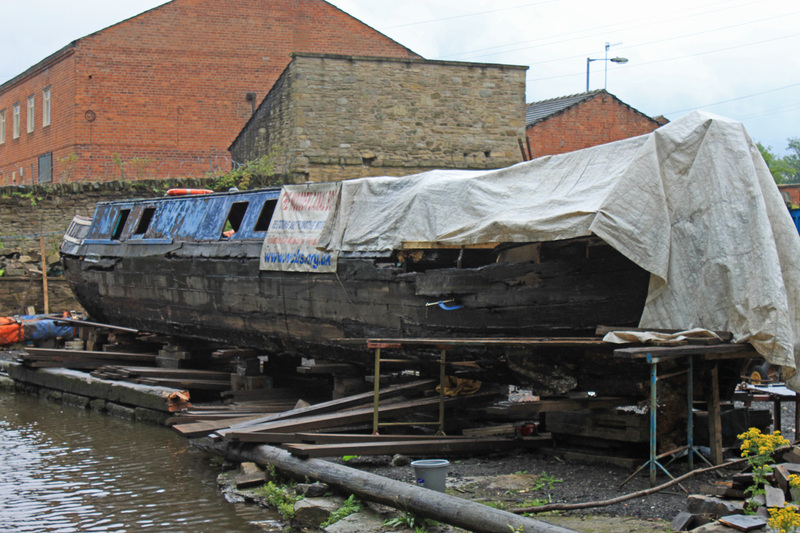 The book gives heart to any would be canal restorers - if they can reopen the HNC you can restore anything! Most tellingly it reveals how the restoration movement grew from small beginnings and little official support to an organisation which employed hundreds. 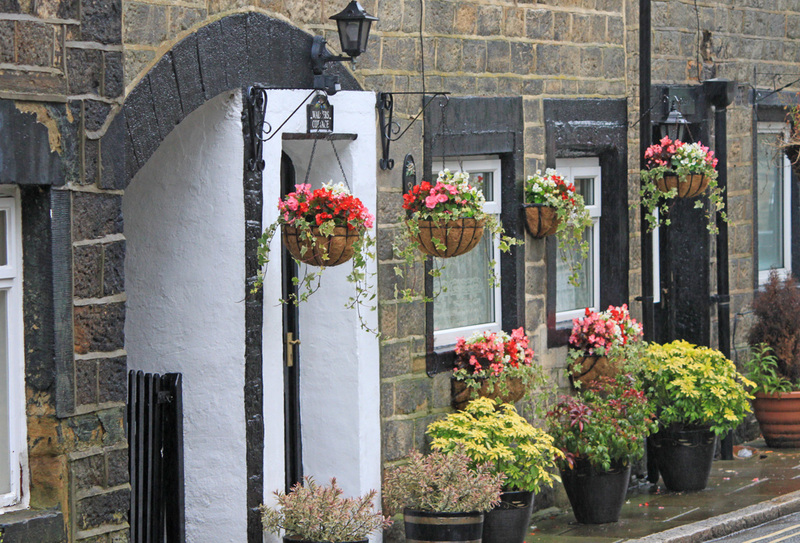 The project moved with the times, embracing whatever grant or scheme was available, labour under the Manpower Services Commission's job creation scheme, local grants, municipal council grants, reclaimed land grants, European monies and finally the National Heritage Lottery Fund. Its the story of the persistence of a few and the contributions of many over a period of 25 years. They tackled what they could, where they could, slowly gaining credibility and momentum till finally the towns of Huddersfield, Slaithwaite and Stalybridge embraced it to the extent that they re-modelled their town centres to accommodate the reinstated channel. 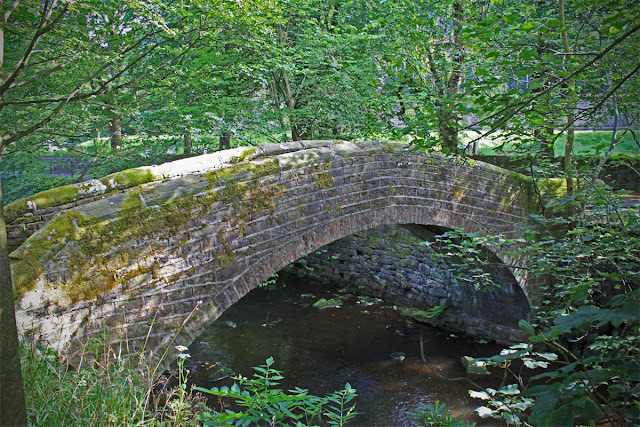 Maybe it was a project of its time, coming to fruition when the planets were in alignment, but I think it proves that if you press on through the seasons, the good times and the bad, waterways dreams can come true. The end was somewhat bittersweet. 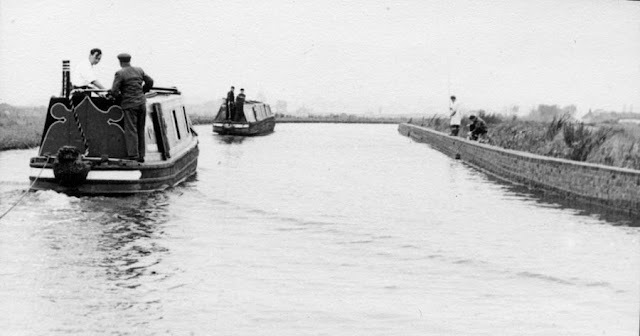 After restoring nearly 1/3rd of the canal themselves the big boys rolled in to oversee the restoration of the final (huge) elements and in so doing wresting much of the glory for themselves. 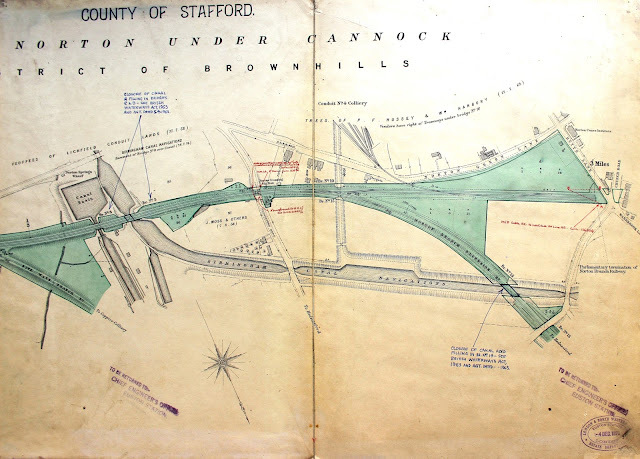 I guess it was inevitable really, but with the canal society having primed the project for a successful conclusion its a shame they glory was not more equitably shared. This book goes a long way towards setting the record straight, crediting all and sundry for contributions made. All in all its a fascinating read for restoration enthusiasts and general boaters alike. 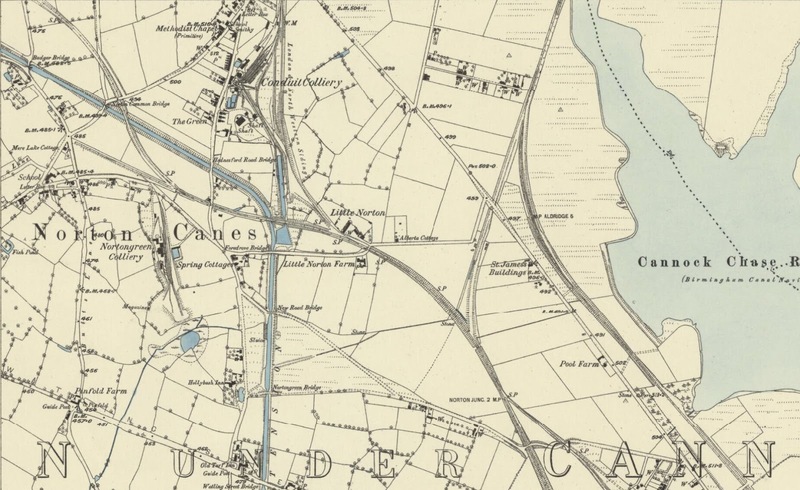 So, as you labour your way over the Pennines this book provides a fascinating insight to the shoulders on which you are standing, and the implausibility of a single Pennine Dream which was realised twice - nearly 200 years apart. 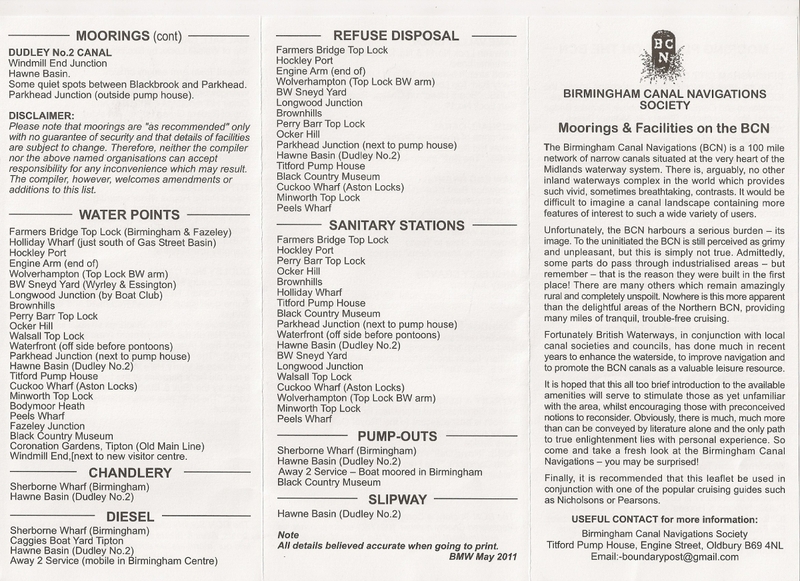 One of my more enduringly popular posts is my list of preferred mooring sites on the BCN. The fact that the post attracts a steady stream of visitors means that it is a question on every boaters lips. 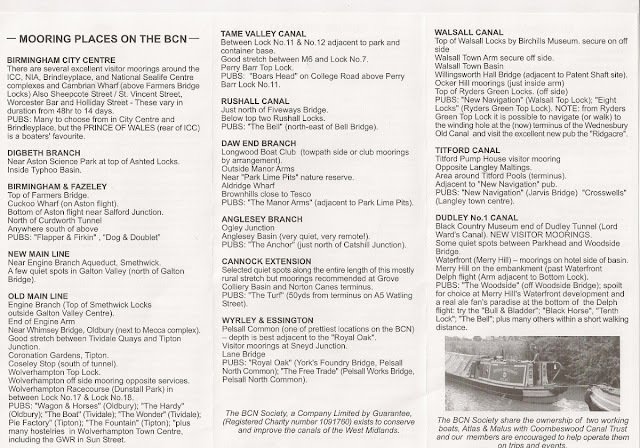 My list is a bit hit and miss, based on my personal experience but as my knowledge of the BCN has grown I have found other sites I would use. They may be in the Championship rather than the Premier League, but they are quite safe and usable. 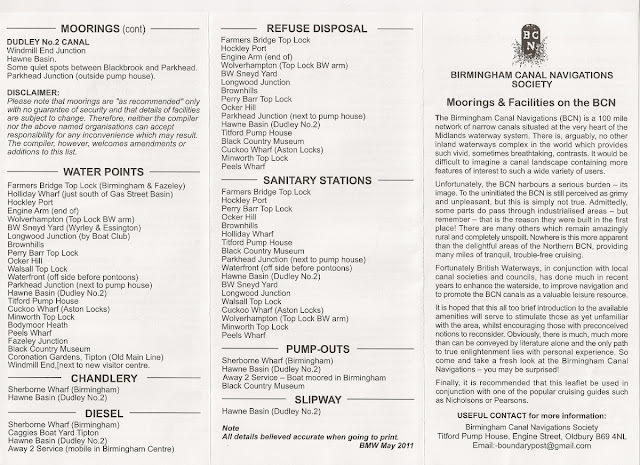 The Birmingham Canal Navigations Society (BCNS) has recently published an up to date list of suggested moorings on the BCN whih includes the various facilities dotted around. Its a real shame that the BCN carries an unfortunate reputation for grime and crime - the reality is so different. .... admittedly, some parts do pass through industrial areas - but remember - that is the reason they were built in the first place! There are many others which remain amazingly rural and completely unspoilt. Nowhere is this more apparent than the delightful areas of the northern BCN, providing many miles of trouble-free cruising. Every boater should sample more of the BCN than a mad dash down the New Main Line. 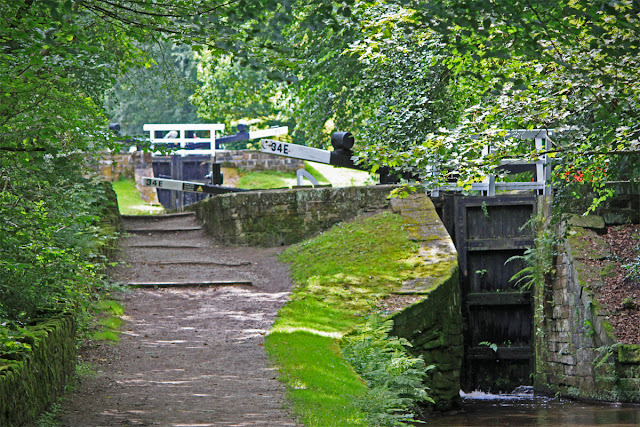 Its a fascinating 100 mile wonderland and if the idea of venturing onto those obscure remaindered canals to the north is a bit too much for you, why not have a bash at the BCN Marathon Challenge which will be taking place over the late May bank holiday in 2012 or if that is a bit too frenetic there is always the annual explorer cruise which covers the same ground over a more leisurely six days. For up to date information on the BCN keep an eye on the BCNS website. And so we come to the end of another Watery Tale. 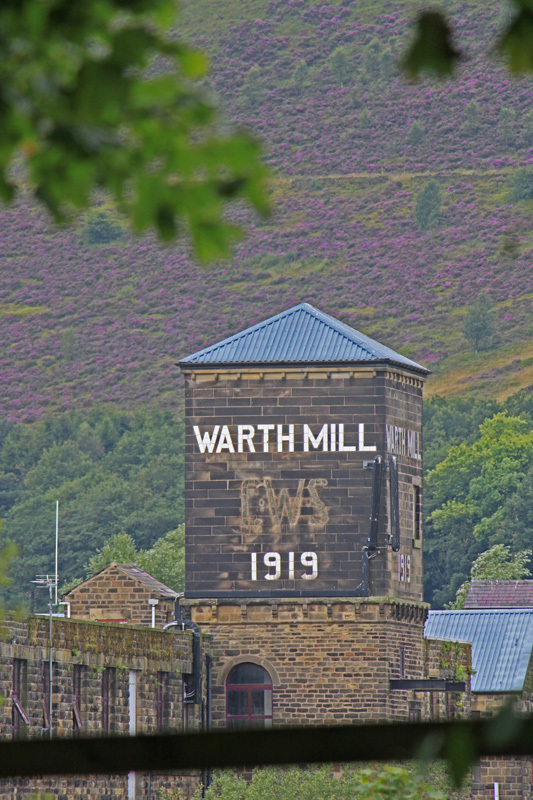 Our two week holiday which took us down the length of the Trent and over the Pennines is over. 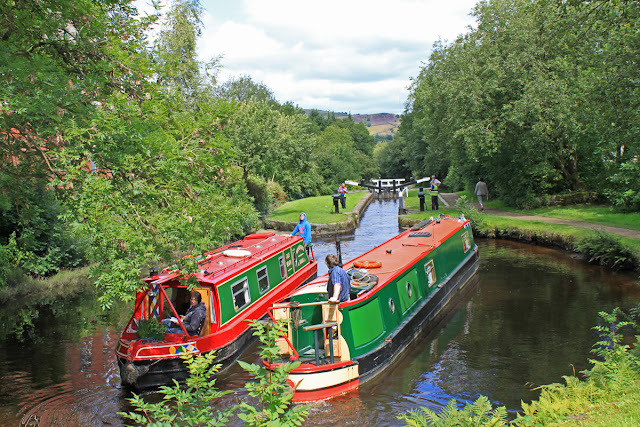 We slogged our way up the Marple flight, following another boat and so having to turn every one. The ramblers kept us company on the lower half and then as we entered the town a steady stream of gongoozlers helped pass the time of day. Kids are fascinated by boats and Belle gave three of them a ride through a lock - much to their delight. With nowhere to moor at the top we pressed on, eating as on the move and searching for a source of diesel and a pump out. My Pearson suggested an Anglo Welsh base but that has been consigned to history but finally, a mile or so before Bugsworth, we came across a private marina who offer both services. It was a bit of a run around to find someone to help us, but we got there in the end. During my hunt for staff I came across firstly an amazing Ferrari out front and then four racing cars being prepared out back. The mechanic was very happy to show us round these formula threes, two fitted with specialist engines and two with Toyota MR2's. Jeff loves his cars and was in his element drooling over their sleek lines and complex innards. It turns out that the marina owner is a keen motor racing enthusiast. 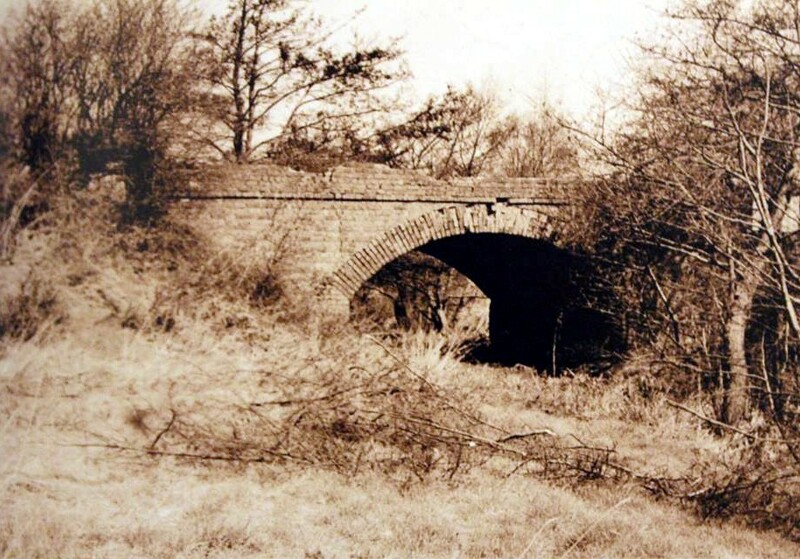 Then it was on the Bugsworth and journeys end. 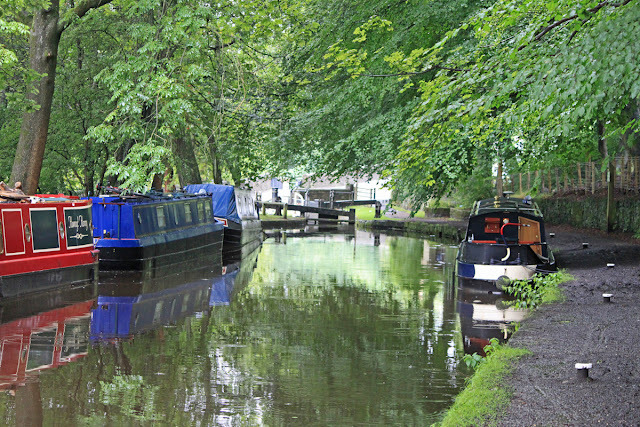 Time to clean the boat, drink a pint or two in the Navigation Inn and then off to sleep. This location is very atmospheric but slightly marred by the road noise from the A6 which skirts the southern boundary. 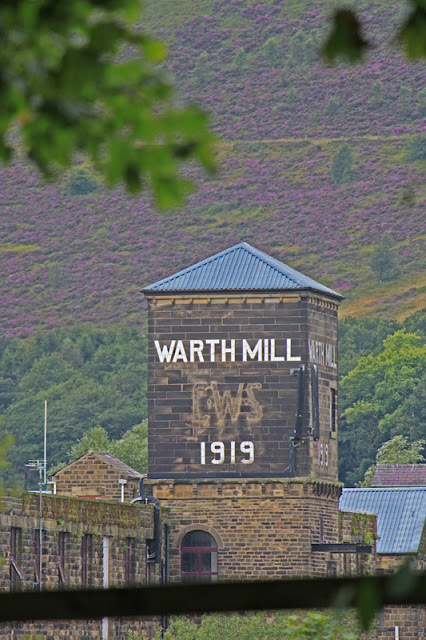 Martin and Adam duly arrived with our car the next day, returning to Birmingham via the Harecastle Tunnel. Capt Ahab is becoming more well known and Martin reported a significant increase in the number of "Aye Aye Captain's" hurled in his direction! 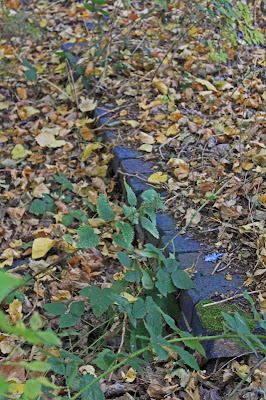 With autumn approaching my thoughts have started to turn to my wintertime hobby of lost canal hunting. In fact I had a bit of time on my hands at the weekend and spent a lot of it exploring some of the lost backwaters of the northern BCN. My latest expedition included the Sandhill Arm, The Slough Arm and The Lord Hay's Arm all of which yielded a surprising haul of interesting remnants. This has given me a lot of material to publish as the days draw in, and then there is the record of my kayak expedition of the Driffield Navigation back in August. So, if you like my Abandoned Canal posts you are in for a feast over the coming month. 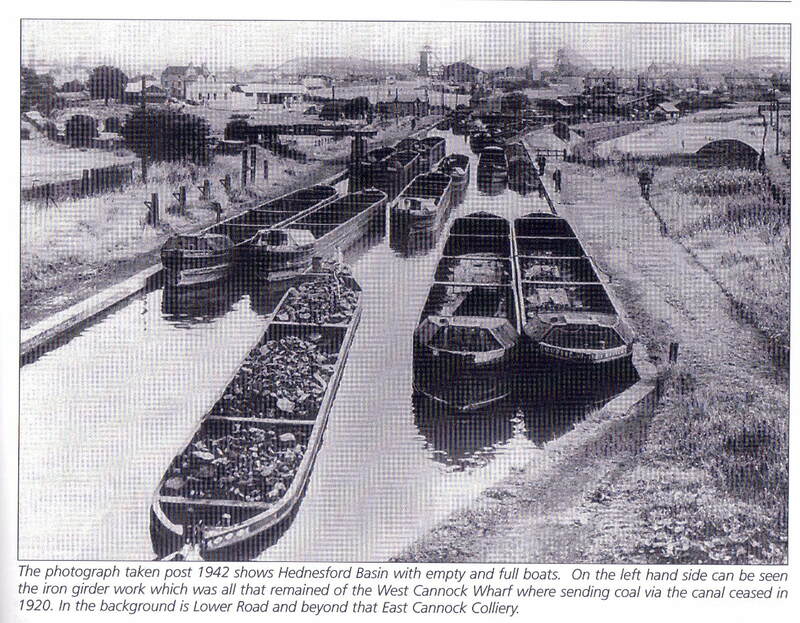 Cannock Extension Canal taken from Richard Chester- Brown's "The Other 60 Miles"
Just to get you in the mood here is a one off post about the Cannock Extension Canal. 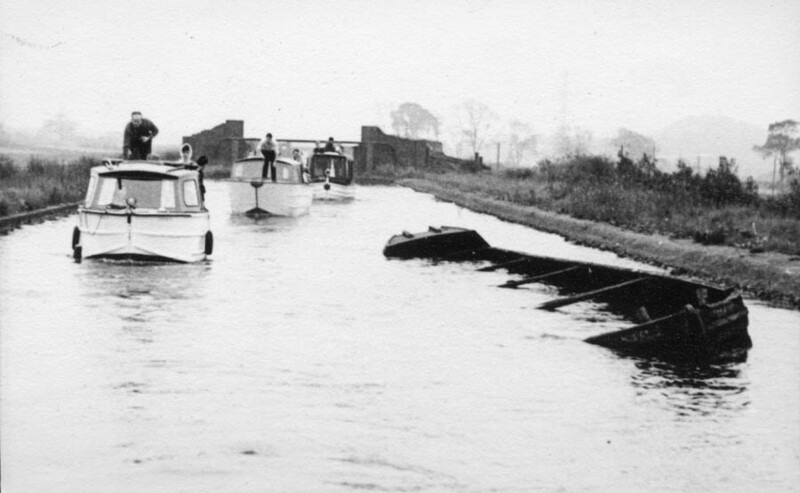 The current head of navigation is at Norton Canes Boatbuilders where the canal comes to a very abrupt end at the A5 or Watling Street. Just across the road the track continues for a few hundred yards till it too runs out overlooking the very recent M6 Toll motorway. Well that where I left it for ages till I had another look on Google Earth and realised that a bit of exploration could reveal a few traces. 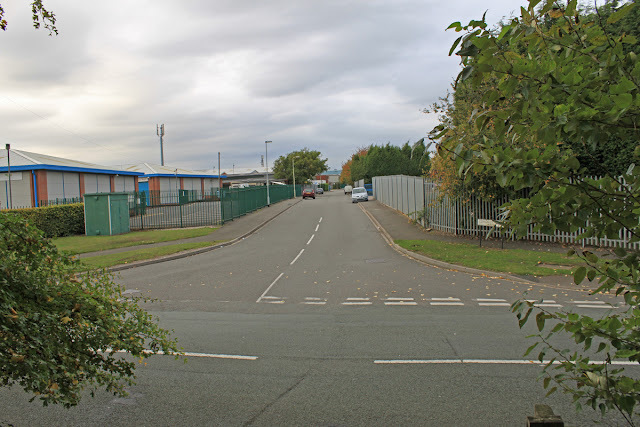 My starting point was Conduit Road, an unremarkable industrial estate which carries the name of the Colliery which used to occupy this area. A walk back over Betty's Lane brought me to the top of a tree lined embankment, and the filled remains of the Cannock Extension Canal. 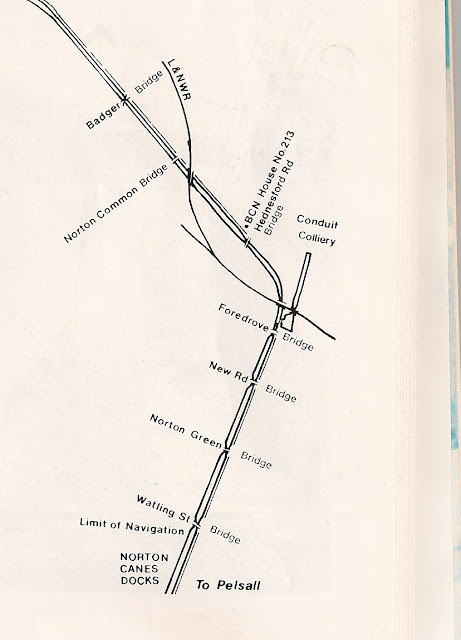 Of course, all the road crossings have changed since the line was surveyed by Richard Chester-Browne 30 years ago but Betty's Lane would appear to be the site of Foredrove Bridge, with the colliery arm now replaced with Conduit Road. Walking back along the canal the towpath appears to be in very good shape, considering the apparent lack of traffic along what is effectively a dead end. 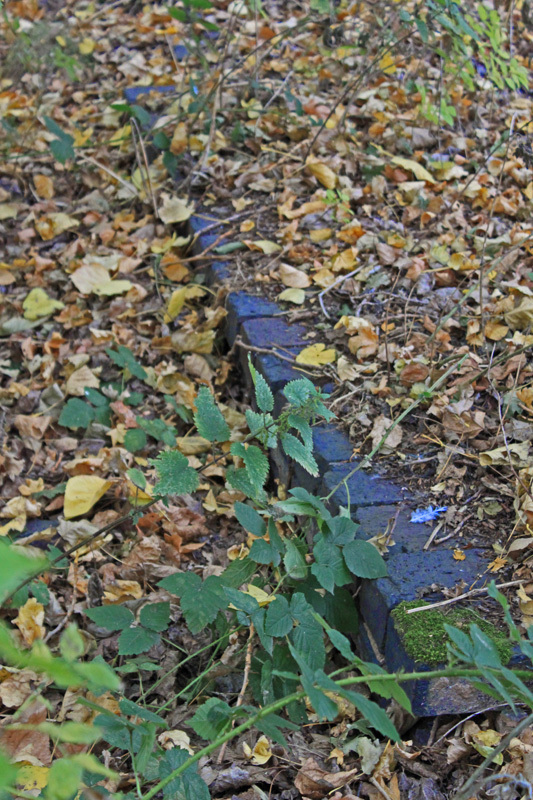 But scratch the surface and the reason becomes apparent - a pavement of blue engineering bricks and a clear channel edging. A bit further along there are the parapets of New Road Bridge, straddling a waterless channel. 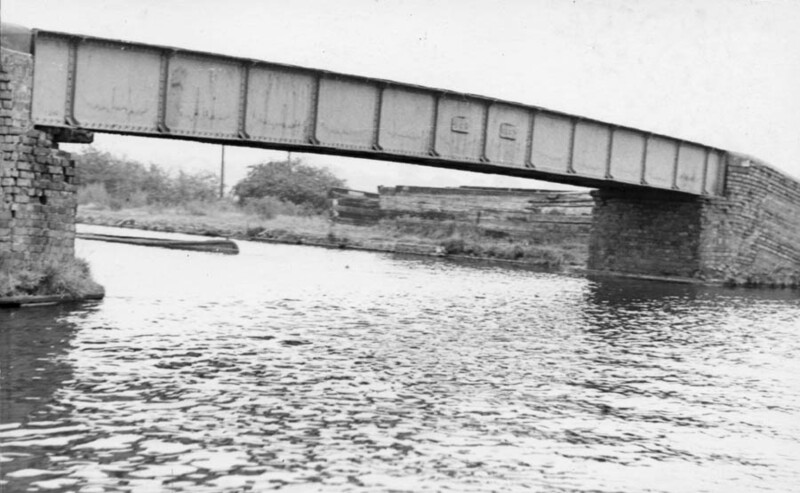 This is a truly surreal site for a bridge over the canal - which sits on top of a 50 foot embankment. But after stopping to reflect on this for a moment all becomes clear. 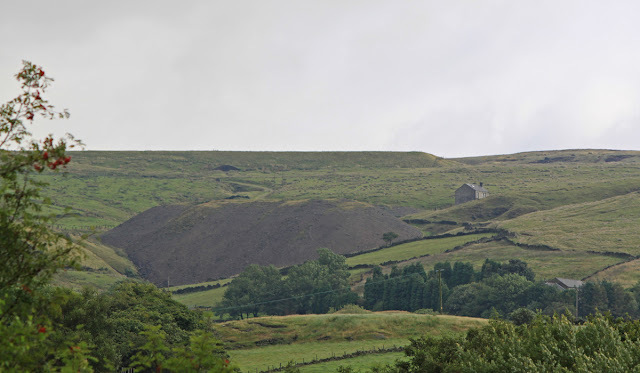 The area has been subjected to massive opencast mining and all this activity has stripped the ground away. What you see now looks nothing like it did in the 1950's. The tree lined embankment continues for a few hundred yards and then it comes to a full stop, Norton Green Bridge having sat somewhere in mid air above the M6 Toll. 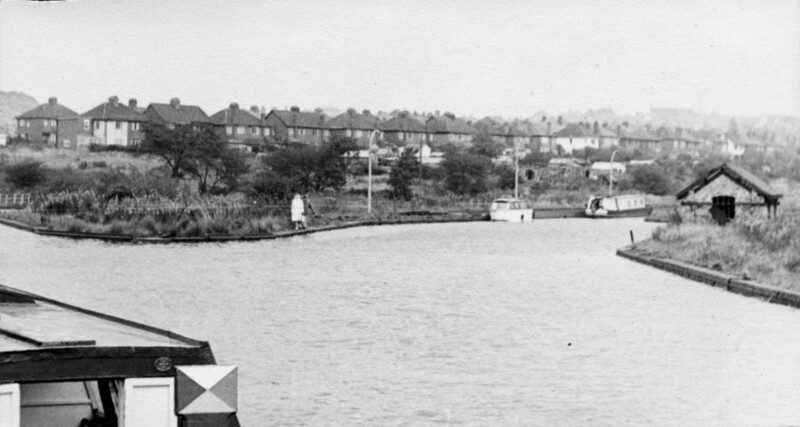 Going the other way from Conduit Road the canal veered round to the west, passing through Norton Green. 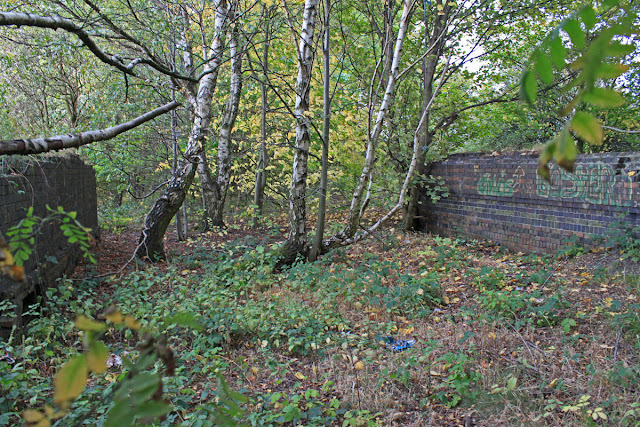 I feel sure that if I knew where to look this area has some more elements to reveal, one road is even called Lock Keepers Close (not that there was a lock anywhere nearby) but I couldn't find them. 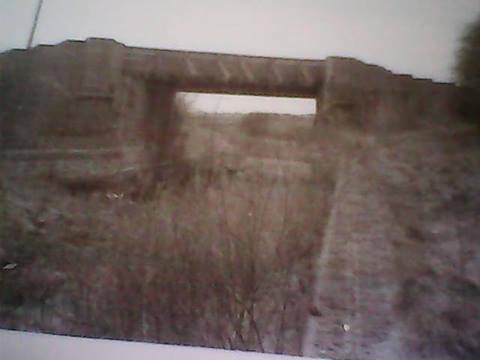 So there you have it, a few hundred yards of embankment, some brick edging, a bit of a bridge and a new road on an old line. Not a lot, but more than I expected with the tantalising prospect of something more in the future. Don't bother to search between Norton Green and Churchbridge - that really has been scrubbed out and there is nothing about the contemporary landscape which even vaguely resembles what existed before, except maybe a tantalising little oblong shaped ornamental pond at Churchbridge which just so happens to be the old pound below lock one. For a better Idea about about the scene at Rumer Hill Junction look here. That's 24 hours of solid rain we have endured. 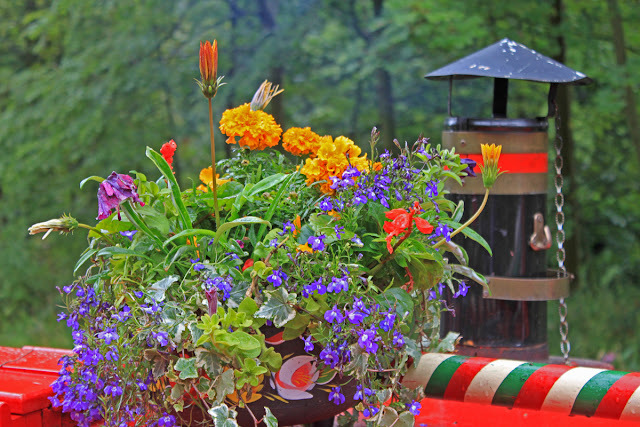 Not misting rain or showers but a steady drumming on the roof as big juicy raindrops fall from heaven and leave the towpath awash, the rivers running in spate and the by washes a heaving torrent of foam. 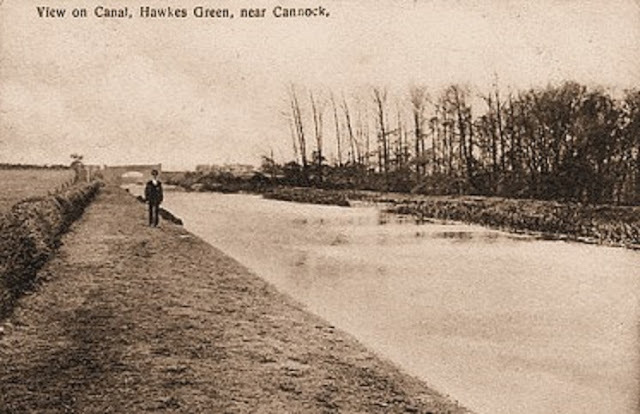 This isn't the shallow HNC, or the drought stricken canal system we have come to know and love. We skulked in our beds for a while, hoping that the worst would pass and finally starting at 10.00am when the rain eased off. It was a short lived reprieve and soon we were cowering under brollies as the rain beat down. But we were undeterred and ploughed on. As they say at Outward Bound - its not he wrong sort of weather, its just the wrong sort of clothes. The trouble is that it was just too warm for working locks in over trousers, so we opted for keeping our tops dry and letting our trousers get soaked. 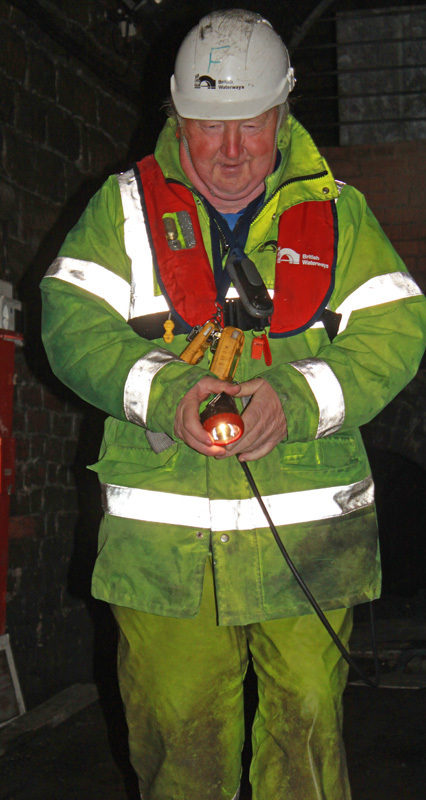 I felt a bit bad at lock 18W - we rounded a corner and found a boat sitting in the chamber with the skipper inside making a brew and getting out of the rain. 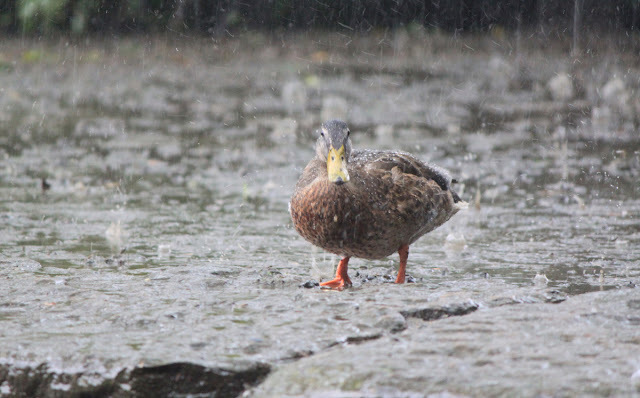 I would have done the same, have done the same, but we needed to move on so we tooted him out and he good naturedly moved his boat on, whistling a tuneless song to himself, the rain driving into his unprotected fleece. Sorry mate. We passed a further two boats at Woodend, one of the few moorings in the area. This section of the restoration effort was undertaken on the 80's when BW was going through its "hydraulic phase". 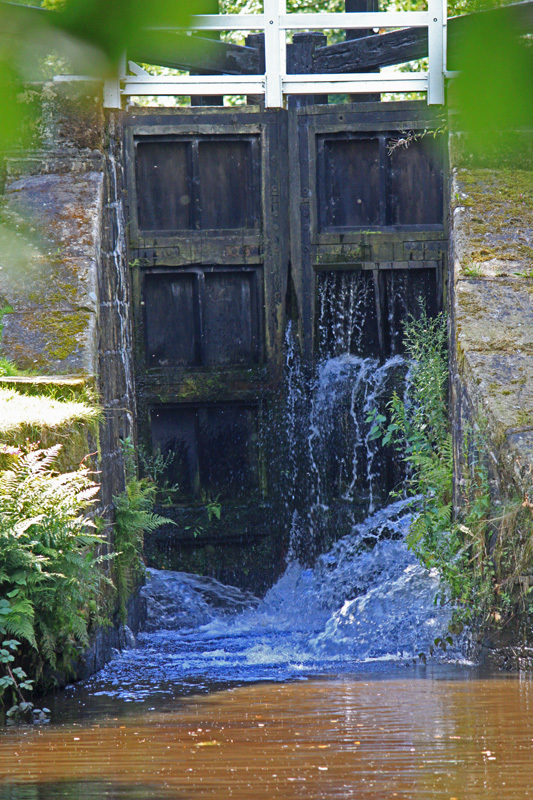 As a result the paddles and slow and heavy, with at least one paddle not working in every lock. All this rain was weighing down the tree branches, making navigation difficult with everything on the roof being swept off, coolie hat, chimney, boat hook and fishing rods. 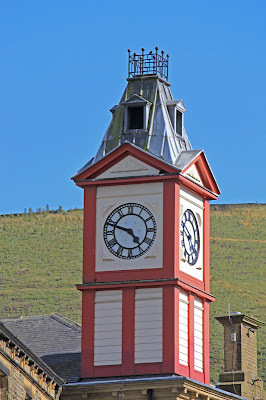 It was slow progress down to Stalybridge. 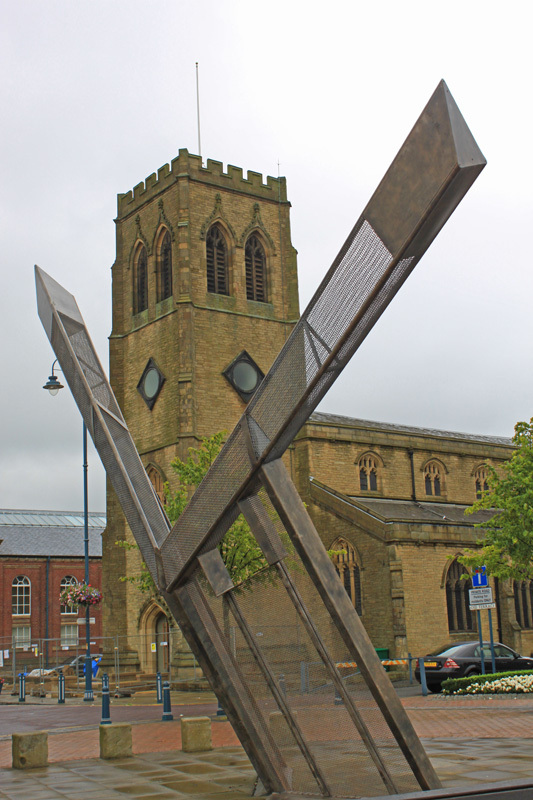 Knocking Stalybridge is a bit like kicking a dog when its down. However, apart from a very convenient Tesco's I can find very little positive to say about it. 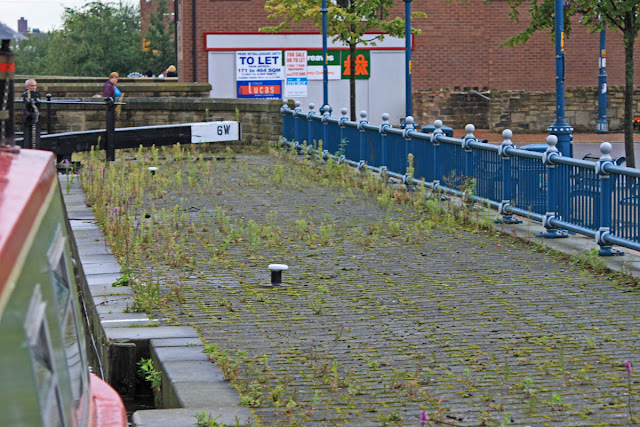 Whereas the restored canal has enhanced Uppermill and Slaithwaite, the fortunes of Stalybridge have not improved since the canal was reopened. 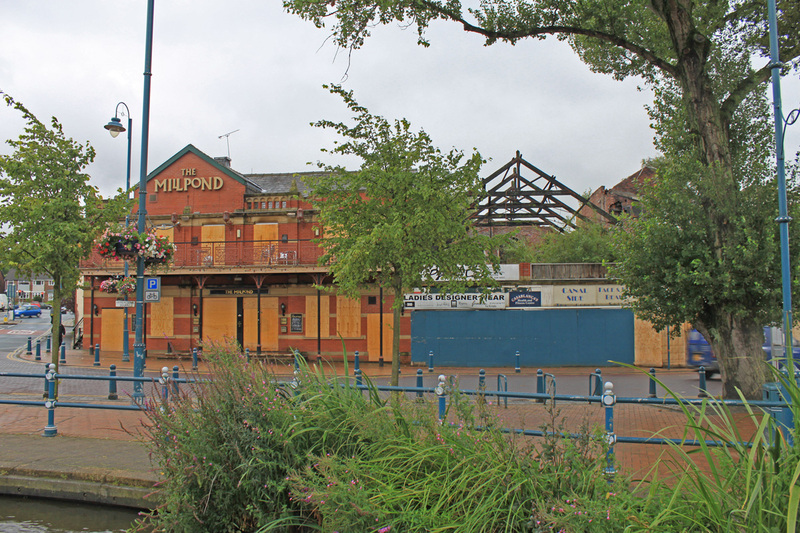 Not that it's the canals fault, it's just that the town seems to be in terminal decline and the current economic paralysis isn't helping. 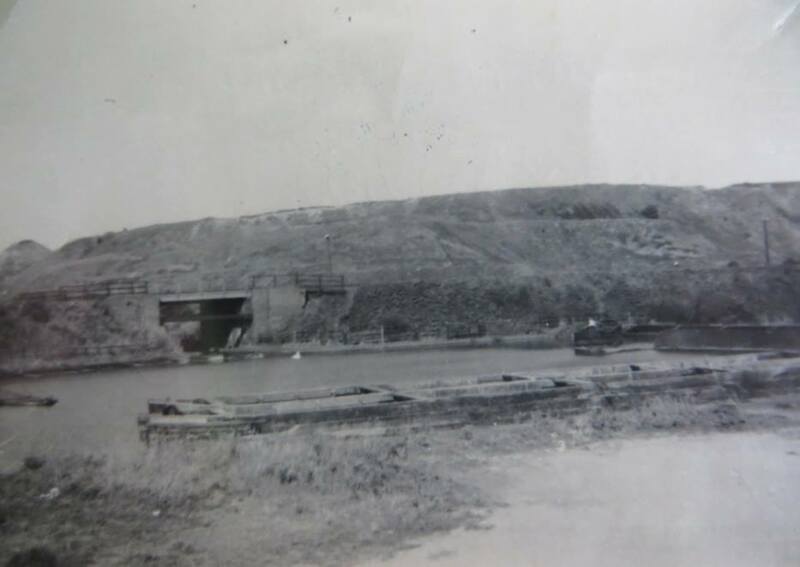 The canal lock surrounds are knee deep in weeds, the burned out buildings from two and a half years ago still stand black, charred and gaunt. Even on a Thursday afternoon most of the shop shutters were firmly closed. A sad sight indeed. Even the doughnuts from Tesco's were stale - a fact which seemed to encapsulate the state of the place. Just below Stalybridge Jeff had a near miss. 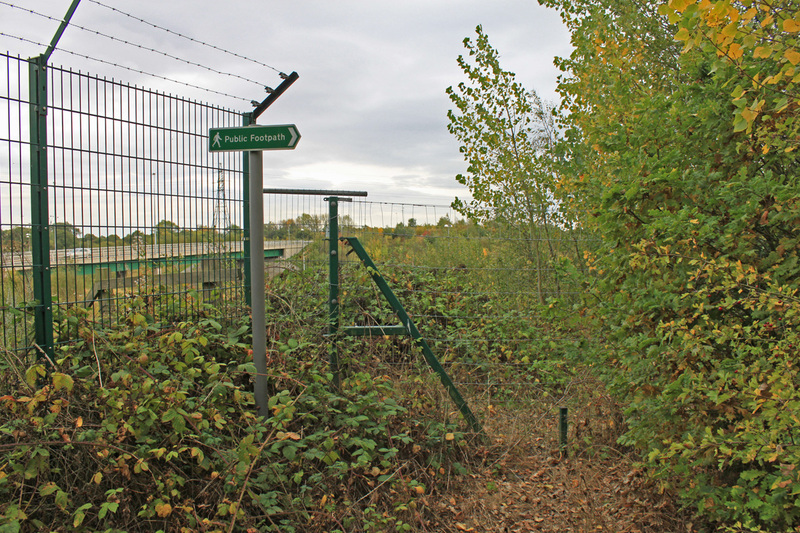 He misguidedly decided to take a short cut across the top gate and slipped, straddling the gate and bruising his knee in the process. It could have been so much worse so it goes down as a lucky escape. Lock 1W is a complete swine. 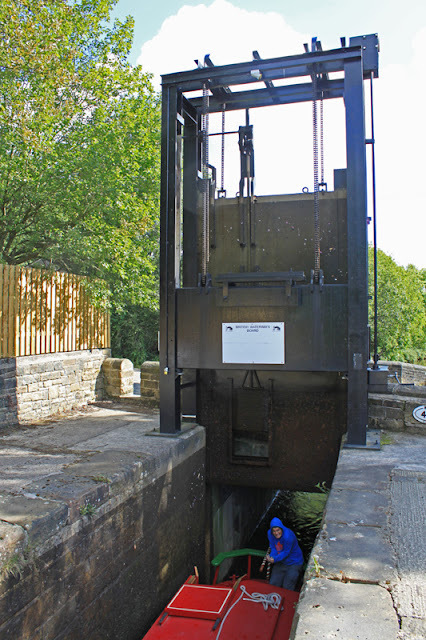 The bridge configuration meant that the gates and paddles had to be built with a bespoke hydraulic arrangement, which once again is horribly stiff and left me aching and panting for breath - a final twist to the Huddersfield Narrow Canal's tale. So our crossing of the HNC has been one of two halves - beautiful sunshine on the east but pouring rain on the west. If I am being honest the last couple of days have been far from the most enjoyable boating I have done, even this is my favourite canal. Finally, as we approached Portland Basin the rain eased and we were treated to a glorious overcast sky! Well, it was an improvement! We turned onto the familiar waters of the Lower Peak Forest Canal and freed of the rain we just kept chugging along, eating up the miles. With no locks to interrupt out progress we pressesed on without even a map, sipping our G&T's and dropping a trail of Pestachio nut shells in our wake. 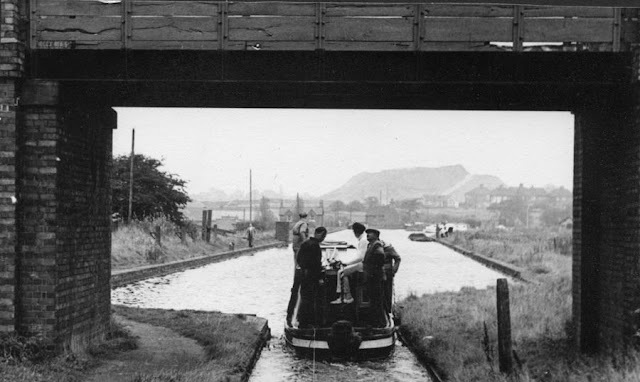 Then, as the clock passed 8.00pm, we saw Marple Aqueduct approaching in the distance so we moored in the wide section to the north of the aqueduct, which was a quiet spot with just the occasional train on the adjacent viaduct to remind us that civilisation was not far away. 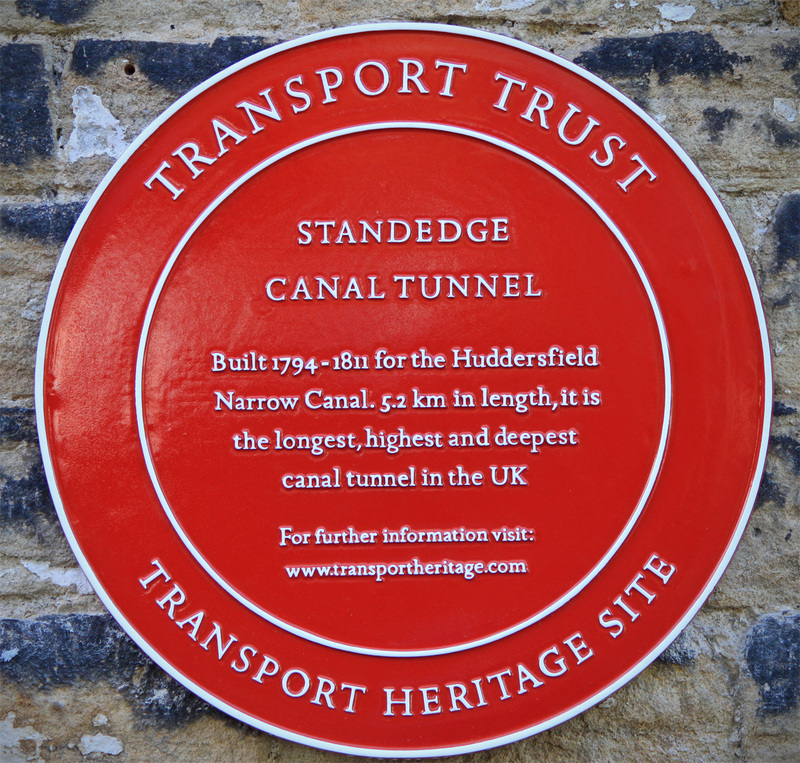 A curious feature on the Huddersfield Narrow Canal is that its longest pound is at the summit, of which the vast majority is underground. We found ourselves in pole position for the run through the tunnel, ready for our 8.30am departure which we had booked way back in Easter. Our chaperone for the morning was Fred Cater, the undisputed subject matter expert on the Standedge Tunnel. Fred is a great guy and has the amazing ability of mantaining a nearly uninterrupted 1.5 hour commentary on the life and times of this huge hole in the ground, with no repetitions and certainly never boring. We have had the ten bob tour in the past, but this was the whole works. 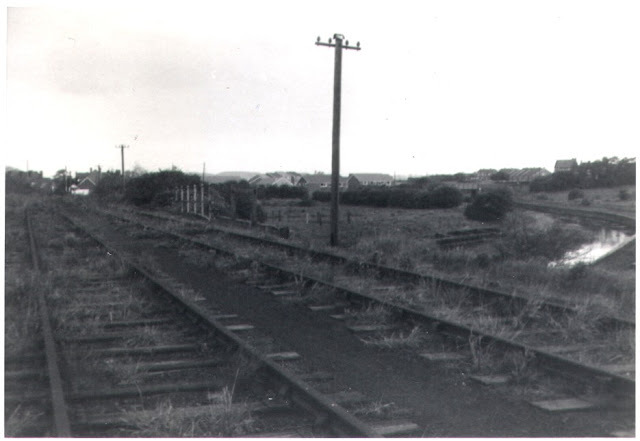 For the 1st half of the journey we were shadowed by a BW Land Rover and then we were on our own, calling back to the Marsden control room as we paused in selected adits. They have a nifty little system which tracks boat progress through he tunnel, with positions logged by motion sensors and supplemented by calls - take a look in the office next time you are passing. There is a particular narrow section about half way through which provides skippers with a real navigation test. The threshold for a good passage is 2 bumps but with a lot of attention I was able to keep a clean sheet. Our passage time was about 15 mins faster than in 2009, but well short of the 1hr 16 record, not that we were in any hurry. 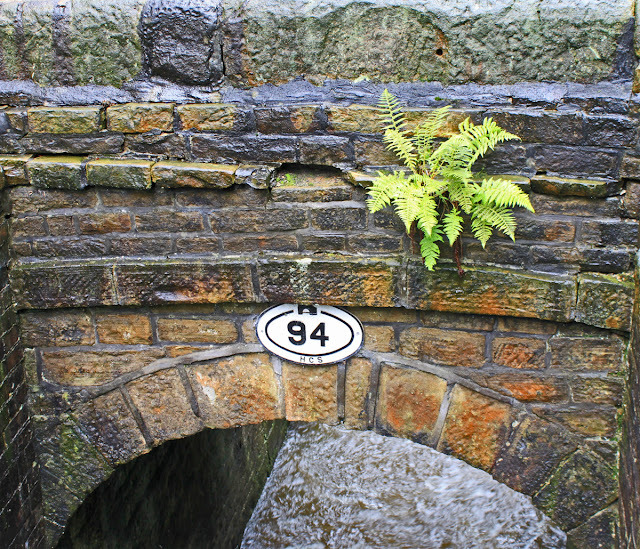 It was raining as we entered and was still bucketing down as we emerged at Diggle, dropping Fred off along with the hard hats and fire extinguishers before making a very squelchy descent down the locks to the Transhipment Warehouse at Dobcross. 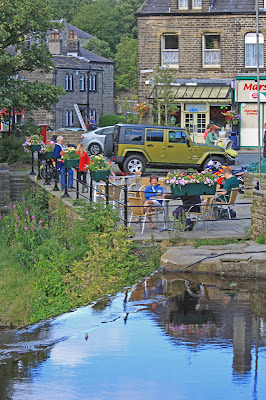 With water streaming down our necks we decided to take a break at Dobcross, a pause which allowed for lunch and a visit to see Bob Gough in the Huddersfield Canal Society's office. 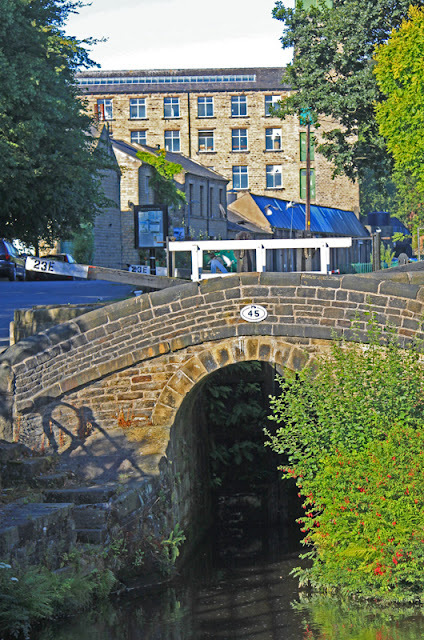 Dr Bob is the author of the brilliant Huddersfield Narrow Canal - A Towpath Guide which is a far superior cruising guide to my Nicholson, which just can't provide the detail needed on a canal with an average of four locks a mile. We picked up a 74 club plaque which will sit alongside the BCN Marathon plaque as a memento of a truly remarkable canal. With the rain sluicing down we lost heart at Uppermill, mooring in the winding hole and settling down to watch the rain turn the towpath into a quagmire. Even the ducks looked fed up. 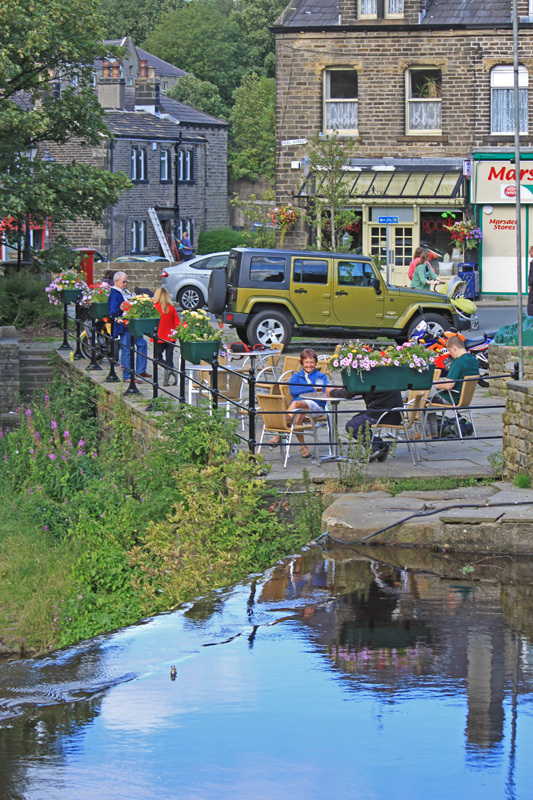 Uppermill is a great little town which seems to have picked itself up by its boot straps when the mills closed, reinvented itself and now remains a bustling and progressive centre. Its no surprise that the HNC renaissance started here. 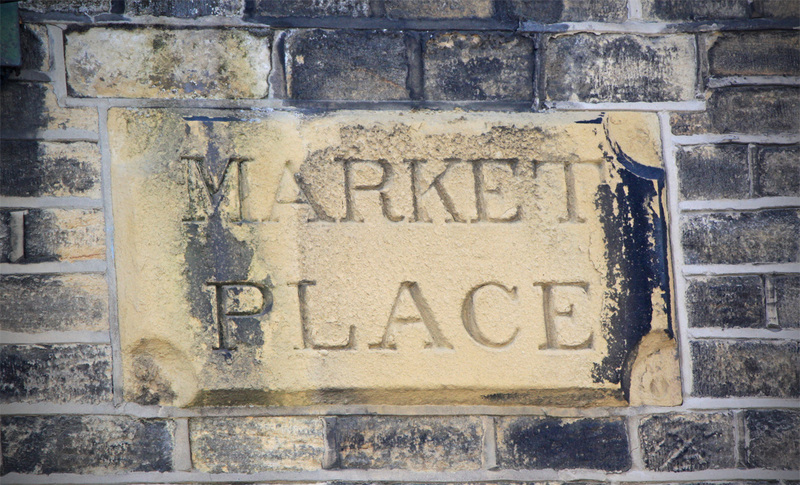 The mills have become desirable apartments and the high street is all spick and span with most shops occupied. I spent the afternoon dozing and reading Pennine Dreams, the official account of the restoration of the Huddersfield Narrow Canal. It felt very appropriate to immerse myself in this detailed account whilst actually making our way along the waterway. I like to take a look at the surrounding towns when I get a chance. 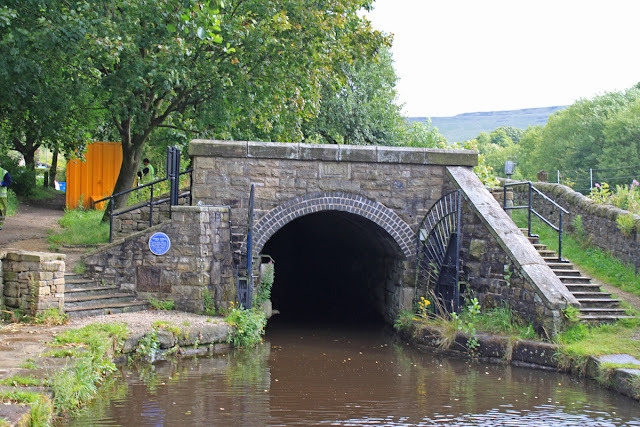 Our arrival at the Marsden Portal of the Standedge Tunnel at 3.30pm offered such an opportunity and with Marsden sitting back from the canal it was an opportunity not to be missed. 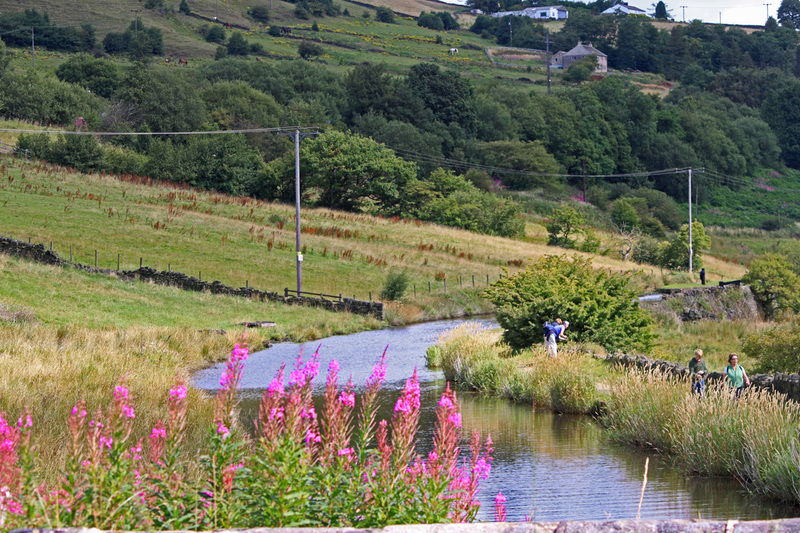 We set off back along the towpath to the lock beside the station and then down the hill path towards the parish church. Its a steep path put well worth the effort. Actually its no big effort to get to the town - the effort comes on the way back when you puff and pant and your calf muscles start to hurt. 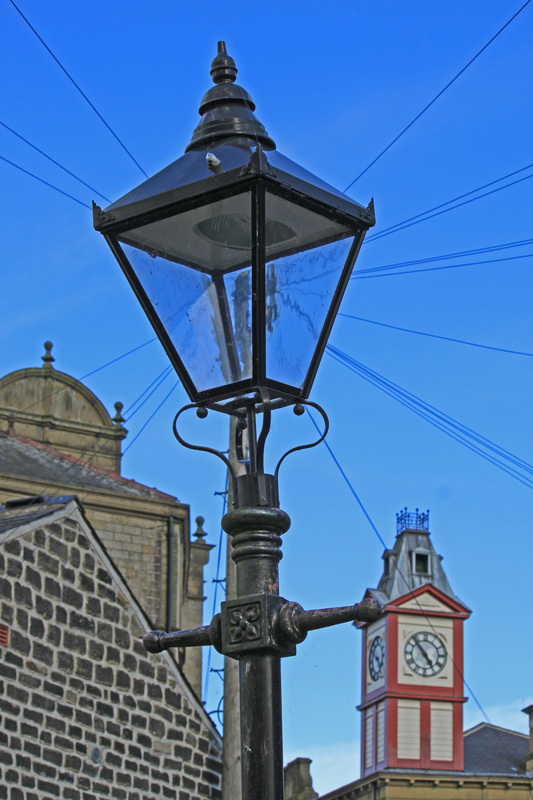 Here is a selection of photo's takes from around Marsden. I took a series of photos of Slaithwaite last night and then accidentally deleted them before they were downloaded to my laptop, so a repeat exhibition was undertaken this morning - der! Actually, the morning light was much better so the cloud did have a silver lining, but at the expense of a boat setting off ahead of us and setting all 21 locks against us. We passed under the towns low bridges and noted that the warning chevron is still missing the chunk we knocked off two years ago! 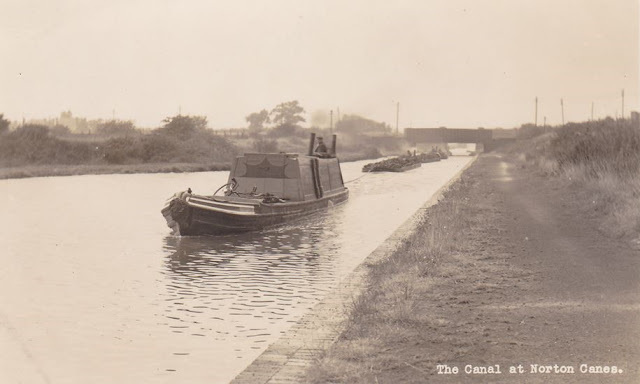 The locals like the canal and they like to see boats moving along it, with many coming over to watch our progress and reflect on the last 10 years. The first lock is easy but then you hit the guillotine at 24E - a beast of a contraption which was installed in place of traditional gates as the adjacent access bridge had been widened. This massive sheet of steel has to be raised with 137 stiff turns of the lock key and then another 137 on the way back down again. A tough way to start the day. To be honest, the 3.5 miles up from Slaithwaite are one long flight of locks with only the shortest of breaks below 32E. 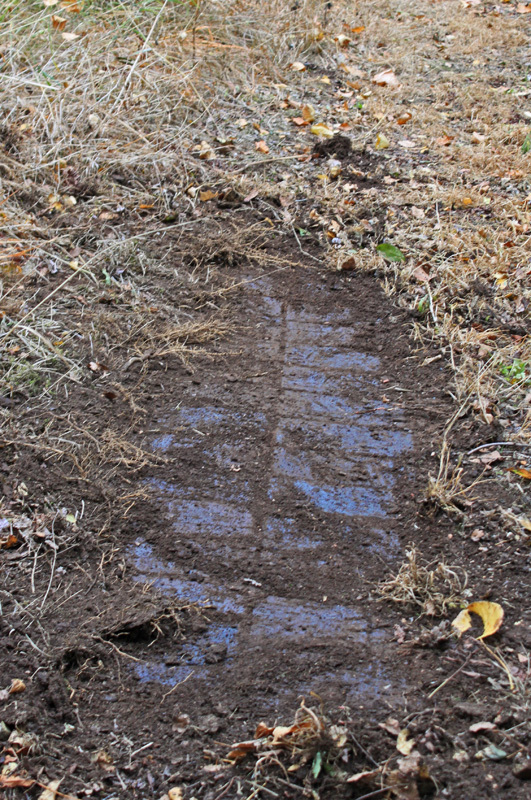 This upper half of the eastern side was dogged by a lack of water. It wasn't the supply that was the trouble, it was the fact that we were the second boat up and each short pound was depleted by two lockfulls before we entered. 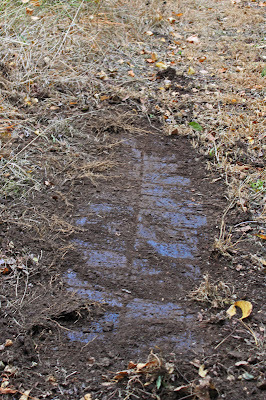 We dragged the bottom most of the way but the slowness didn't matter much - we had less than 4 miles to travel. 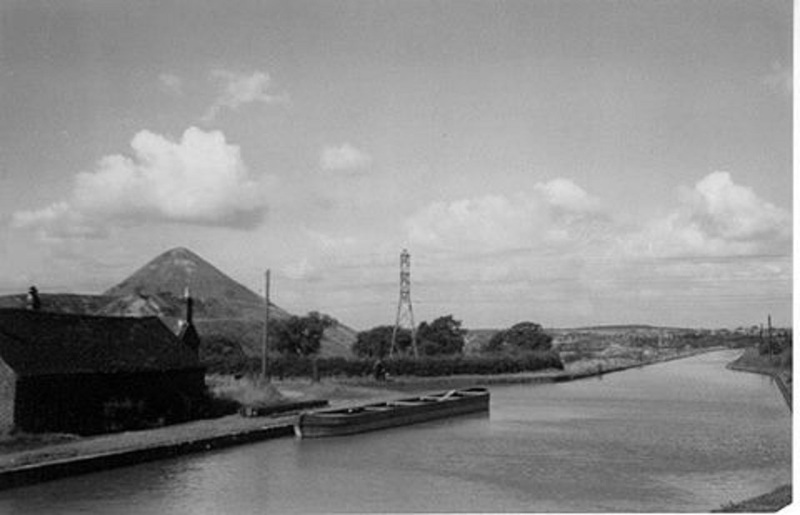 The River Colne kept us company, throwing up the occasional ruined mill and adding a bit of built landscape to the general panorama. The Sparth Reservoir marks a boundary of sorts. 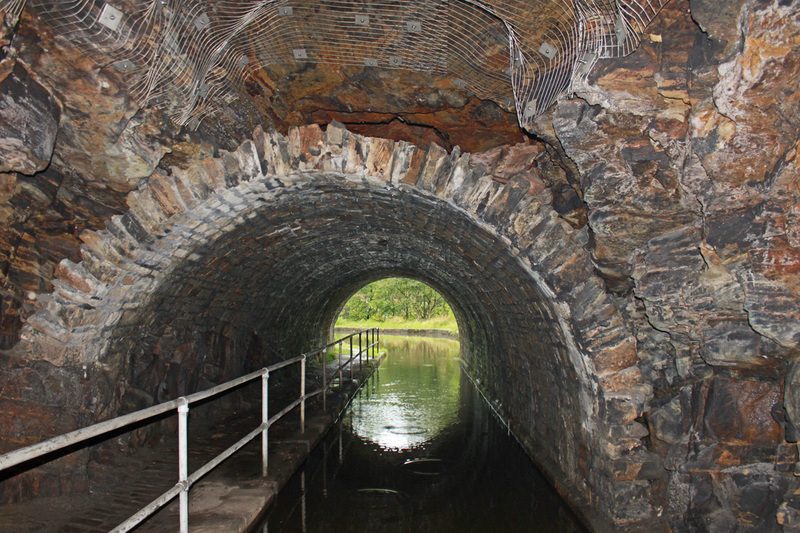 Till here it is free cruising but lock 32E represents part of the controlled section right up to the tunnel. The flight is unlocked at 10.00am on the day before a passage and you have to be out of the top at 4.00pm. 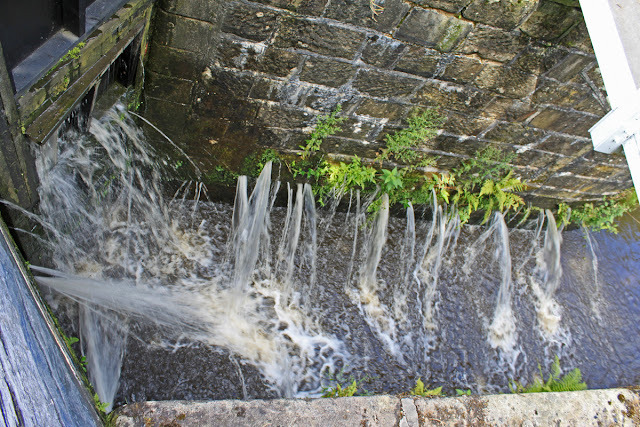 This last climb is accompanied by an increase in the leakiness of the locks. The water pours out of the shored up gates as well as through the loose fitting masonry lock sides. Perhaps the most spectacular is 38E, sitting above a pretty circular pound with cascades of water erupting as the boat ahead tries to make a level. These leaks are so bad that if you shut one top ground paddle the lock actually starts to empty! The lock gates were installed in the early days of the restoration, back in the 1980's and were made to minimum sepc by Job Creation schemes so I guess its no surprise that they are now approaching the end of their working lives. BW is doing a mass gate replacement this winter which should improve things somewhat, not that there is a lot to be done about the chambers themselves. 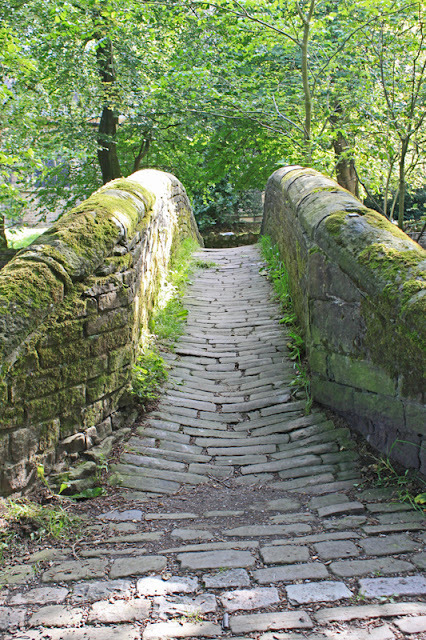 In contract to the finely worked limestone of the Marple Flight, these are made of rugged blocks or rough hewn stone and have been prone to leakage since the day they were built. On the foraging front I did spy a small clump of Bilberries on the offside, but much to Belle's disappointment they turned out to be isolated and insufficient to deliver a useful quantity. Maybe if we had time to explore the heathland up above we could find more.... but not today. With the bottom scraping on the bottom we finally hauled ourselves through 42E and into the summit pound and the tunnel visitor complex. You need to top up with water before the tunnel passage to maximise headroom and there are two options: 1. use the tap beside the visitor centre (very slow) or 2. wait till the trip boats have stopped and use the fixed hose next to the BW control room. 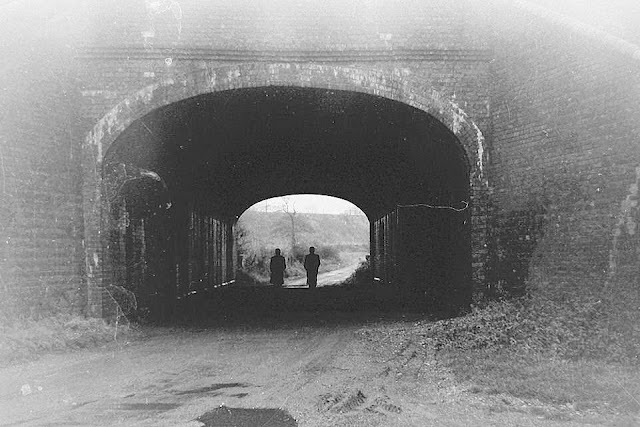 The latter was quicker and more convenient so we went with that, spending the night with our bows almost in the tunnel portal. 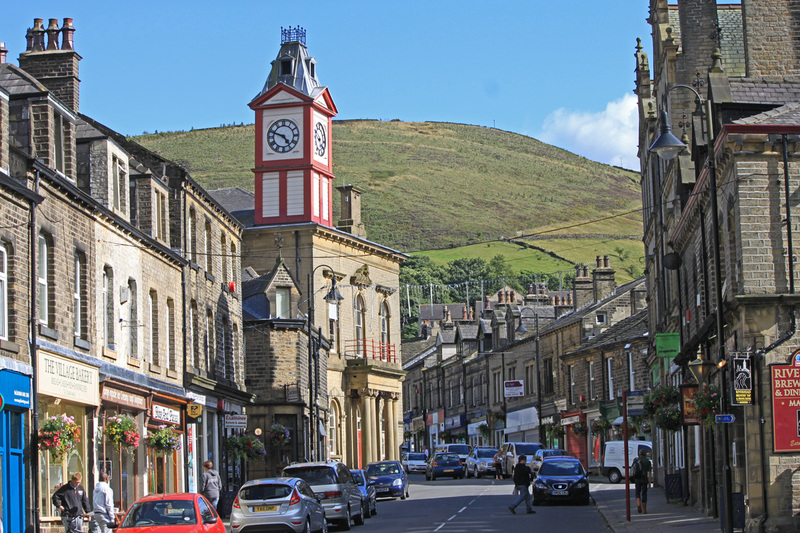 We had a prowl around the complex, spending money in the gift shop and viewing the art exhibition before taking a stroll down the hill into Marsden town centre. 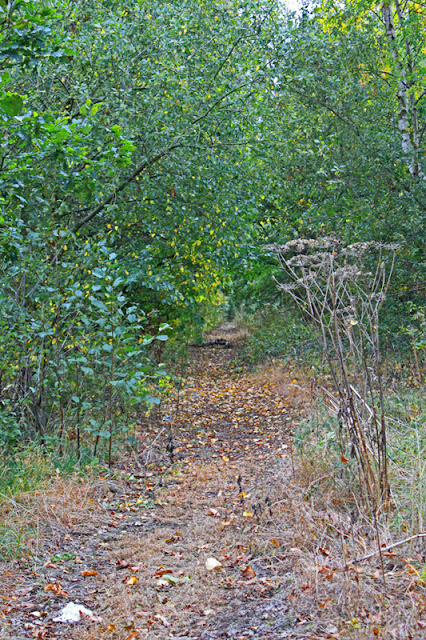 The woodland path was filled with wild rasberry canes but sadly the season was long gone and only a few stragglers remained. 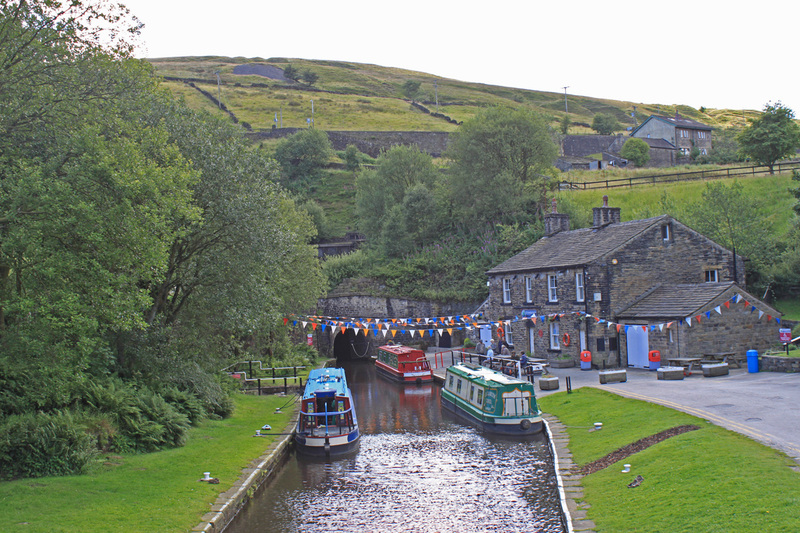 The Marsden mooring is quiet from a boat perspective, not that you get a lot of passing traffic, but you the passing trains do rumble by at frequent intervals and the bunting flaps away above out heads, celebrating the canals bicentenary.